The other day I saw one my favorite modern Indian chefs in NYC, Suvir Saran, make this roasted cauliflower dish on the Martha Show. 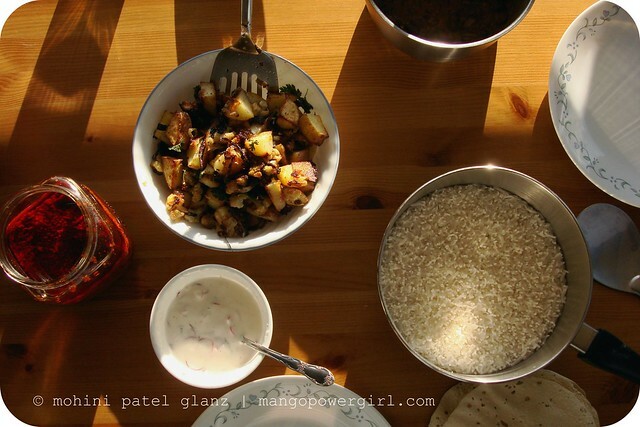 In my own home I do a similar dish, but with potatoes and a shortcut — I skip grinding the spices. At other times and for many Indian dishes, I would do it all from scratch as that’s why Indian dishes are so intense in flavor. My Oven Roasted Aloo Gobi, however is soul food — a tasty, every day side dish with no fuss and which doesn’t need any fuss. You get the same slow-cooked Indian flavor without the grind 😉 which to me is a big deal these days as I’m constantly running out of time. Who isn’t! We like this recipe so much. When you make it, the home smells so amazing that it may lead your neighbors or guests to think that you are making some complicated feast. Plus, I could never get my hubby to eat slices of onions in anything, but in this the onions perfectly caramelize in the oven, along with garam masala and oil. He loves it! 3. Lay everything (cooking times for different potatoes vary, so if you’re using any other kind cook potatoes first & then add onions & cauliflower and let everything brown together) evenly in a big baking pan, big enough to make sure nothing is over-lapping, else it won’t cook well. 4. Stick the pan in the oven and shake it all up to move it around every 20 minutes or so. Keep an eye on it, as you don’t want the onions to burn before your potatoes cook. It’s finished when it looks like it: the potatoes will look nice and crispy, and onions will look the worst, but will taste great! It should all be finished in about 30-40 minutes. 5. Garnish with cilantro and serve right away, with whatever else your heart pleases. We recently had our Oven Roasted Aloo Gobi with rajma, rice, papad, pickle & raita — and raita is the recipe I will publish next! yumyumyum! when are you going to do a cookery book? Beautiful MPG! Good to see you back again! That looks absolutely delicious. I haven't been making much Indian food lately and I sure do miss it! that looks very simple and delicious as well. may try it! Looks delish! Can't wait to try that out! I too enjoy Suvir Saran's cooking -did a class with him a couple years ago at his restaurant about the 3D aspects of spices. Interesting. This dish looks very tasty. I've been in a cooking mood more and more these days – will have to give it a try. I can't wait to try this with new potatoes! How interesting! I love the simple aaloo gobi sabzi and will definitely try this version out. I must tell you that I'm crazy about this recipe. It is in heavy rotation at my house. My three year old can't get enough. We serve versions of it over rice or with lentils Oce a week. So easy and so delicious. I never liked cauliflower until I roasted it. Yum. Thank you! Suvir is one of my favourite chefs, too. back in the day i used to use egullet and we became “foodie friends”, i soon thereafter stopped using egullet- but it's nice to see Suvir's name in the media now! i love this dish- and yes, like your reader #1- i wonder- when are you doing a cookery book? Delicious!! Loved this dish with grilled steak tips….Wow, so good. Thanks for posting this. We loved the recipe! This is the best aloo gobi that we have ever made! Thanks, Mango Power Girl!